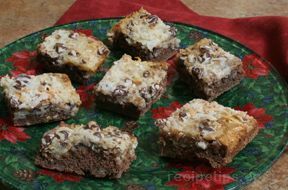 The sweet combination of coconut and two flavors of baking chips creates a bar recipe that will surely suit your taste. This moist and chewy bar is just one of our many delicious chocolate recipes. We have yummy recipes using chocolate that won't want to miss. Place the margarine in the baking pan; then put the pan in a heated oven to melt the margarine. Remove pan from the oven and add the graham cracker crumbs; stir until crumbs are evenly mixed with the melted margarine. Press the graham cracker crumb mixture into the bottom of the pan. Sprinkle the coconut over the crumb crust. Sprinkle the two different flavors of chips over the coconut. Pour the sweetened condensed milk over all of these ingredients. Put in an oven preheated to 375° F for approximately 20 minutes or until edges are starting to brown. 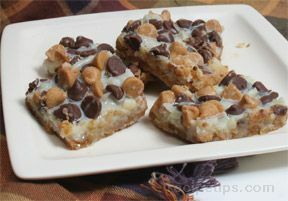 Remove from the oven and allow bars to cool completely before cutting into squares. Note: To make bars easier to cut, place them in the freezer for 1 1/2 to 2 hours before cutting. 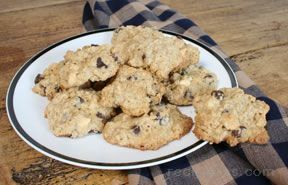 Also, the milk chocolate chips and peanut butter chips can be substituted with semi-sweet chocolate chips, white chocolate chips, or butterscotch chips, according to your taste.